On 29 October 1839 the Bankruptcy Register listed John Harrison Curtis as a “bookseller.” By 1841, Curtis lost his patrons and his career was pretty much in shambles and his Dispensary was sold to the aurist William Harvey. The invention of the cephaloscope and the publication of his treatise on the instrument were aimed as an approach for him to revive his career. In 1842, Curtis wrote a letter to Sir Robert Peel (1788-1850), a former patient of his who he appealed for assistance. In the letter, Curtis refers to his On the Cephaloscope (1842) as evidence enough for his merits for an appointment to Queen Victoria’s household as Surgeon-Aural surgeon-in-Ordinary. But the treatise itself doesn’t spend much time discussing the merits of the instrument—most of the book is spent outlining the basic physiology and anatomy of the ear, the cranium, and the organs of the voice, explaining that the details are “absolutely necessary in order [for] the proper application of the instrument.”[i] In the chapter on the cephaloscope, Curtis spends little time actually discussing the merits of his instrument in practice, or providing extended cases studies of its application. But these details seem relevant, if not required, for Curtis to his credibility to other aurists. In particular, his long explanation of the augmentation of sound seems superfluous, but it appears to be central for his explanation of the design of his instruments. The fact that Curtis used an instrument—as opposed to another “miraculous cure” or nostrum or surgical procedure—to extend his authority is noteworthy. It reveals much into the embodiment of medical and surgical authority within material objects and how instruments can be used as rhetorical devices. The cephaloscope, above all, was more of a symbol of orthodoxy for Curtis; as historian John Harley Warner points out, instruments that were presented as symbols of unity were means for preserving confidence at times of severe professional dislocation. Movements towards a more unified specialty based on Parisan pathological anatomy and diagnosis, became crucial epistemological and rhetorical shifts for aurists; by appealing to notions of “science” and “professional” they were in fact redefining the boundaries between the newer type of aurists like Toynbee, and those like Curtis who held on to their passive practices. Diagnostic instruments in aural surgery thus rested not on some abstract notions of what constituted as evidence for aurists, but rather on how authority could be asserted through material objects. [ii] These instruments served more than the mark of a surgeon. They were a symbol of the aurist’s skills and his judgment, considered to be more valuable to the public than a diploma or certificate, which could easily be forged. The durability of any diagnostic instrument rested on a practitioners’ power to correlate what was heard or observed, with specific disease symptoms. The stethoscope for instance, not only unified the medical profession and transformed the patient-practitioner relationship, but it popularized a new skill for diagnosis—auscultation—which required the practitioner to make use of his auditory senses. Of course, the practitioner had to be trained for such a skill. 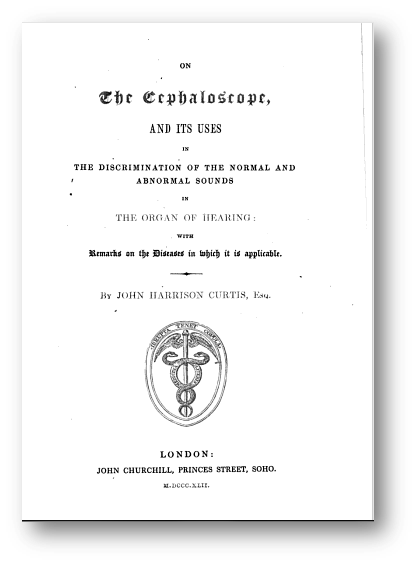 [iii] Curtis hoped to do the same for aurists: since diagnostic instruments in aural surgery were long plagued with the problem of limited examination due to insufficient light source, he argued the cephaloscope could remedy this limitation by appealing to the aurist’s other sense. Sounds could convey images of internal anatomy, revealing damages to the structure of the ear, blockages in the ear or Eustachian tubes, or evidence of lesions brought by other diseases. Moreover, the cephaloscope was a far safer diagnostic tool than the speculum, forceps, or even Eustachian catheter, all of which, if improperly used, could cause pain and suffering in the patient. The reticent state of British aural surgery in the 1840s, however, made it difficult to construct a profession unified by a material expression of its authority. Nearly all aurists agreed diagnosis was the key to improving the state of aural surgery and securing their authority as specialists; more precise instruments would allow them to forge their skills as diagnosticians, and thus, prescribe more effective medical or surgical treatments. But some aurists, like Toynbee, concentrated on dissection in order to improve their clinical understanding of ear diseases; others, like Wright, recommended language training as alternatives to surgical treatments. 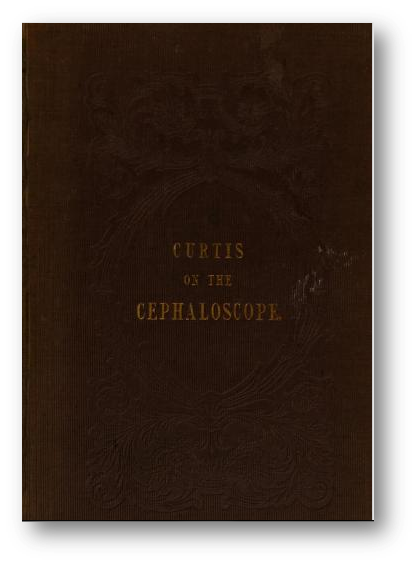 [i] Curtis, On the Cephaloscope, 1. [ii] Jennifer Stanton, “Introduction: On Theory and Practice,” in Innovations in Health and Medicine: Diffusion and Resistance in the Twentieth Century, ed. Jennifer Stanton (London & New York: Routledge, 2002). [iii] W.F. Bynum and Roy Porter (eds), Medicine and the Five Senses (Cambridge: Cambridge University Press, 1993). ← Yes, this is me.